Home / Family / Dinner Made Easier! My schedule has been nuts lately with teaching and the kids! I rarely have time to grocery shop and meal prep. I have always loved cooking and making healthy meals for the boys and my husband. When I have time I love to roast salmon and sweet potatoes, it is by far one of my favorite dishes to bake and eat. I have tried many different meal services over the last year and they have all been great and very different from each other. Take a look at some of my favorite food delivery companies, and let me know what your favorite is. I truly love Real Eats meals, created by a single father, who discovered the art of sous-vide (French for “under vacuum”). It is a method of cooking in which food is placed in a plastic pouch and cooked in a water bath for longer than normal cooking times. The meals are healthy and shipped once a week to my apartment. All you do is boil them in water for 6 minutes…seriously! The boys fight over who gets to share mom’s meal too. Great for nights when I am home alone with all the boys and don’t have an extra hand to cook with. I find myself eating sometimes over the bath so a meal that is quick is amazing for me! Use code KRISTIN30 for $30 off your first order on realeats.com. Offers plant-based, chef-prepared food delivered to your door, with guidance from health coaches. Plantable sees the epidemic of obesity, diabetes and other chronic illness that Americans face due to over-consumption of processed foods. They want to change how Americans eat, they want to bring back real food and good health! They provide lunch, dinner, and snacks. I usually eat fish, shellfish, organic turkey, chicken and sometimes red meat. Eating vegetarian for a week was a nice change from my usual go to’s. I truly love veggies, I’ve just never made them the main part of my meal. Now I realize it’s easy and tasty eating vegetarian meals. Sakara is a wellness company anchored in food as medicine. They deliver organic, plant-based meals and functional products to doorsteps nationwide. They focus on 9 pillars of nutrition! No calorie counting, plant protein, eat your water, greens, good fats, eat the rainbow, nutrient density, sulfur rich veggies, and body intelligence. I love the yogurt parfaits. Sakara is also vegetarian; but unlike Euphebe they focus much more on big salads and get super creative with some of the ingredients they use. The founders , Danielle and Whitney, are true rockstars and I admire all that they’ve created and accomplished. The meals are tasty, dense, nutrient-rich, and all natural. Their produce is fresh and organic, it’s bursting with flavor. They don’t use frozen or processed ingredients and never use preservatives. The oils are also kept to a minimum. They want the natural flavors of real food to come through. I love the fruit and veggies they send; but I often find I need to add a little more of my own seasoning. Ready-to-eat meals for babies, tots + kids. Freshly made with wholesome ingredients. The founders idea was born out of the time consuming and often stressful process of cooking fresh, wholesome meals for her son. Balancing the nutrition and variety, on top of busy lives and limited evening and weekend time, three meals a day, seven days a week, is challenging. 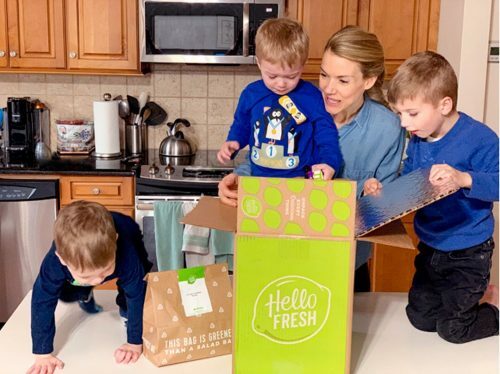 Through this experience and speaking to parents with similar experiences, they felt a great opportunity lay in front of us…to help make it easier for parents to feed their kids healthy, delicious, properly portioned meals, from the start. They make meals for all ages and dietary restrictions. My boys love the meals they send! Provenance Meals delivers organic, prepared meal plans and detox programs that are gluten free, dairy free, with no refined sugar. Designed by wellness experts and health-supportive chefs to nourish your body, our meals and detoxes are delivered to your home or office in the Greater NYC Area and made-from-scratch with unprocessed, local ingredients using traditional cooking techniques. In their meal plans, you choose which meals you’d like from the weekly menu. It changes every week and features the best seasonal, nutrient-dense ingredients. They believe there is no one perfect diet for everyone and not to mention all the different preferences, appetites, and tastes. They use nutrient-dense and local ingredients to nourish your body while doing no harm to the earth. I love how the containers are compostable and recyclable. These meals were tasty and delicous and very healthy. I’m a huge fan of healthy meal kits & just tried out Hello Fresh for the first time. They offer an ever changing menu of healthy, delicious dinner options. My husband I love the meals, as do the boys when they steal pieces off our plates. Recipes only take 30 minutes, and come with step-by-step instructions and pre-measured ingredients (means hubby can make them on my late nights teaching). Use my code (IMCGEE80) to get $80 off your first month of HelloFresh meals! I love trying new meals kits and one thing I love about Blue Apron is the variety. Blue Apron makes cooking fun & easy by sending you all the ingredients for incredible meals. Chefs have teamed up with the wellness experts at weight watchers to design a variety of delicious recipes that make it easier than ever to cook meals that meet your healthy lifestyle. I love making these meals on the weekends when the boys go to bed and my husband and I can relax and have a good meal and have a glass of wine. I truly always discover a new flavor or new way of preparing foods with Blue Apron. Organic produce & clean ingredients and delicious recipes delivered weekly. Sun Basket is a certified organic handler, and strives to source organic produce. They focus on dietitian-approved meals such as paleo, gluten-free, vegan, vegetarian and more make healthy eating easy. Sun Basket signature house-made sauces and spice blends deliver big flavor. The best seasonal ingredients make even the simplest recipes delicious. The packaging is recyclable and compostable, which I love! I found the recipes easy to make and even my husband could cook them up on the nights I was teaching late. They send you clean-ingredient, nutrient-dense food that is quick and easy to prepare. Everything is made without artificial ingredients or refined sugars, and is matched to your dietary preferences, tastes, and lifestyle. Most importantly, the food is delicious and inspiring—we guarantee this is healthy food you’ll look forward to day after day.